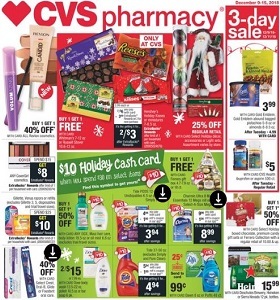 CVS Weekly Circular December 9 - December 15, 2018. Holiday décor on Sale! CVS Weekly Circular December 9 – December 15, 2018. Holiday décor on Sale! -buy 1 get 1 50% off Shea Moisture hair care; $29.99 Philips Norelco OneBlade shave appliances. To see the weekly circular for your favorite CVS store, search by ZIP Code or city, state.